How Does a Pressure Washer Work? | Pro Wash LLC. Pressure washing videos on Youtube are one of the stars of the new “oddly satisfying” trend. In them you see the power of water pressure and the gratifying before and after. Have you ever taken a minute to figure out how they work? No, there’s no crazy soap-like ingredient that cleans caked on dirt. It’s all the power of water! On one hand, they’re a simple machine, it’s just pressurized water after all. On the other hand, there’s an exact science that makes it work. Get answers to how does a pressure washer work & other questions below. We added a few good video links in for good measure, just for you! We’re going to answer that question in two parts. First in laymen’s terms, and then in technical ones. Science-wise, a pressure washer works so well because of water’s chemical structure. If you think back to high school science class, you may remember that water is polar. That means it has two different charges. One positive and one negative. This slight electrical charge makes water stick to things – usually each other. In a pressure washer’s case, it also sticks to dirt and grime. When you add water’s polar quality to extreme pressure you get good results. The water pump behind the pressure creates kinetic energy or energy potential. When the water hits the dirty surface the energy converts to active energy. It blasts away whatever is adhering to the ground/fence/concrete. Since it’s water and not some nasty blend of chemicals, it doesn’t damage most surfaces. When we say damage, we mean chemically. It doesn’t add anything harmful. The pressure is a different story. The extreme pressure (up to 3000 psi) can hurt a person and soft surfaces. Don’t ever play around in the stream of a pressure washer or use it around kids. You can use a pressure washer to wash windows but at a lower psi. Never point the pressure washer directly at the window, or the glass could break. Here’s how all that science-y stuff happens, via the machine mechanics. First, the detergent (optional) connects to the hose. Then, you connect the machine to a water source, like a hose or commercial input. With water and detergent in place, you turn the machine on. Some run on electrical power, while others run like a generator (it depends on the model). The motor turns on and mixes water and detergent together. Some heat the water, but not all of them. The motor plus a small exit hole pressurize the water to its intense PSI. When you press the release trigger, the water comes out and cleans whatever you point it at. There are different nozzle shapes and attachments for different types of cleaning. What are the Benefits of Pressure Washers? Other than the immense satisfaction of using them? There are a few! You can add chemicals to your pressure washer, but you don’t have to. This means you get an intense clean without introducing intense agents into the soil. For people who want to stay as organic as possible, there’s nothing as natural as water. Over time things that build up on your home can cause problems. Dirt, mold, mildew, and mosses can get into the molecular structure of things like brick and wood. Little by little, they break down the integrity of whatever they’re on. You can stop these issues in their track with regular pressure washing treatments. Once a year or once every other will do it. Even if you’re not selling your home, curb appeal matters. You might have a picky homeowners association or are unhappy with the aging color and dirt on your house. Before you decide you need a new external paint job (thousands of dollars), try a pressure washer. Its effects will shock you! Don’t believe us? Check out this before and after pressure washing video. Pressure washers aren’t only for wall siding or driveways. You can use them in other high-traffic areas around your house. Garage doors, patios, decks, swing sets, outdoor grill trays – any hard surface is fair game. You can even drain your swimming pool and give the inside a deep cleaning with a pressure washer! Nothing is perfect, even pressure washers. There are a few negatives to consider before renting or hiring a pressure washer. They don’t get rid of dirt, they blast it away. That means that dirt you’re removing is going somewhere else. Be careful that you’re not splattering the dirt from your driveway up on your house. They use a lot of water. Since they get their main power from water, they’re not drought-friendly. You can use up to 2 gallons per one minute of pressure washing. Make sure you’re not draining city resources during a drought. If you’re water-fine, think about drainage. Where is all the water going to go? This applies to the dirt blasting issue above. Many home improvement stores let you rent pressure washers, but there’s a steep learning curve. If you don’t know how to address the disadvantages above you could make more of a mess than you clean. 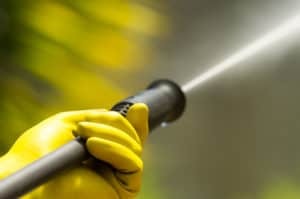 How does a pressure washer work best? In the hands of a professional pressure washing company. These water-pressure experts do one thing: pressure washing. They’ll have insight on what your project needs and come with their own equipment. Based on how quickly and how well they work, it’ll likely save you more than renting your own. We have a page full of positive customer reviews if you don’t believe us or need some reassurance. Read them and then contact us about your pressure washing project today!